Okay, guess the film: cranky old timer with a history of violence shuffles around threatening people with his gun. The Good, The Bad and The Ugly? Nope. Dirty Harry? No. Gran Torino? Try again. The Outlaw Josey Wales? Wrong again. Let me stop you there. We could be here all day listing the 50 or so films Clint Eastwood has played the exact same character in, so you could be – ahem – forgiven for mixing up which one we’re talking about. While Clint’s stint in Unforgiven was his millionth and one he (and we) could have slept through, Alien was Sigourney Weaver’s first, and it was the making of an icon. Both films are similarly themed: reluctant hero goes up against the big baddie that everyone else is afraid of. Except in Unforgiven, Gene Hackman isn’t even a baddie, he’s actually a great sheriff. A town in the wild west with no guns allowed? That’s a great idea, and one well ahead of it’s time. If only Little Bill Dagget was Mayor of London, he wouldn’t have taken any of that crap last week. But Clint ‘I’m the director, it’s my movie, so I get to kill everybody’ Eastwood has to wander in and shoot everybody, one at a time, in the most implausible non-retaliatory gunfight ending since Desperado. In Alien, we have a proper baddie. One that bleeds acid, with two mouths, that lays its babies in your chest. In Alien, we have proper characters, people you actually care about. They’re just normal Joe Soaps earning a wage who have one of the worst days at work, ever. Does anyone care about the cowboys in Unforgiven? English Bob may have a great name, but he arrives just to get beat up and then leaves – pointless, like a lot of the film. 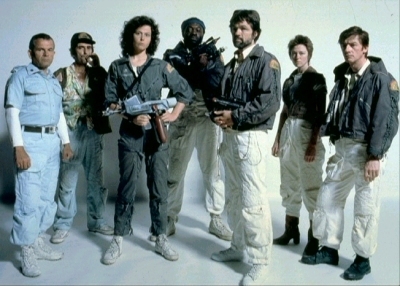 Forget sci-fi, forget horror, forget genre altogether, Alien is one of the best films ever made, full stop. Preferring cowboys, well, that’s just unforgivable. Genres are just guidelines, really. A background. It’s the story, the characters, the writing… these are the things that spring out from a great film. The greatest ones just leave their genres behind. In the pub with your mates afterwards, you can act like a prat (I know I do) and say, ‘Minority Report is one of the best sci-fis of the past 30 years’. But while you’re actually watching Minority Report, you’re so wrapped up in it you forget it’s sci-fi. You just get swept along. The same goes for Alien. Yeah sure it’s set it space and has an, um, alien in it, but it’s also a high-class slasher movie. Like the previous year’s Halloween, only with Sigourney Weaver in her underwear instead of Jamie Lee Curtis babysitting. Unforgiven is a lot like Alien. All the best westerns, from The Man Who Shot Liberty Valance to Young Guns, are in some way about the rewriting of the Old West myth. Unforgiven is no different, yet it also frees itself from the shackles of the western, perhaps because at its heart it’s simply a film about sticking up for your friends, albeit with a disturbing lack of morality. Imagine if Chunk had murdered the Fratellis and you’re kind of there. Or perhaps it’s because it’s just another film in which Clint Eastwood kills everybody. While Alien is a brilliant film, it doesn’t satisfy repeat viewings like Unforgiven. While one of these films centres around a stone-cold, unfeeling killer, the other has a big alien in it. William Munny isn’t just the baddest man in the whole damn town – he’s the baddest thing in the galaxy. When he says he’s ‘killed just about everything that walks or crawled at one time or another’, you can actually picture him stringing up Predators and cutting off ET’s non-glowing fingers. He’s a badass. Ripley would have had no chance against him. She wouldn’t even have got past Gene Hackman, whose Little Bill Daggett is one of the great dastardly villains of cinema. But Unforgiven’s beauty – and the main reason it’s more than a western – is that there are no real good guys or bad guys… just guys who all do really bad things. In Alien you know you’re not meant to root for the big scaly thing that just ate Yaphet Kotto, but Unforgiven is a hodge podge of nefarious types you would never want to come across in a bar room brawl, and that includes the so-called hero. It may not be easy to take, but that’s what makes it a classic. This entry was posted on August 18, 2011 at 12:02 pm and is filed under BATTLES with tags Alien, Clint Eastwood, Cowboys & Aliens, Gene Hackman, Movies, Ridley Scott, Sigourney Weaver, Unforgiven. You can follow any responses to this entry through the RSS 2.0 feed. You can leave a response, or trackback from your own site. There is no contest. I love Clint Eastwood’s films but I’m no western fan. Alien wins hands down for me. Unforgiven. It just has to be. It’s the deconstruction of a genre featuring some of the best written characters of the past two decades. Great writing and arguments as usual, gentlemen. Both superb films, can’t decide…. @mcguinnr… Maybe Clint’s gun in your face will help you decide. Maybe a bucketload if corrosive slabbers, a weird hissing noise and an extendable second set of jaws and teeth would be scarier..
Maybe not – this is Clint, after all. I wouldn’t feel lucky. Wow. Sour grapes much over Clint? Did he eat your wheaties as a kid or something?